At last the clocks have gone forward, days are becoming longer and some warmth is in the air (well, almost, although it didn’t feel like that from the side lines of the football pitches I was at over the weekend!!). Making Tax Digital for VAT is now compulsory for most VAT registered businesses with a taxable turnover above the threshold. This means that it is now a legal requirement for you to keep your accountancy records digitally. If this affects you and you are not yet compliant, or not aware of this change in legislation, then please contact us to find out what you need to do. 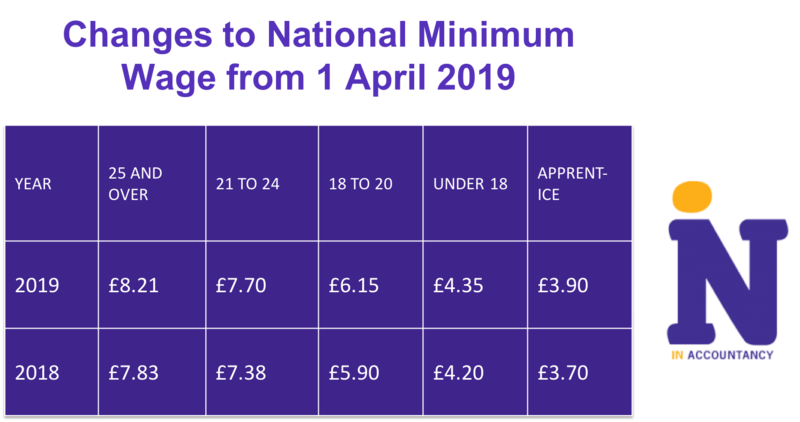 Increases in National Minimum Wage apply from 1 April 2019, meaning that you should review and increase salaries of all employees who you currently pay at National Minimum Wage rate. For workers aged 25 and over the rate increases by 4.85% from £7.83 per hour to £8.21 per hour. This is still short of what the Living Wage Foundation suggests employees should be paid to have what is considered a ‘real living wage’ which is set at £9 per hour across the UK, and £10.55 per hour in London. Unlike the real living wage, which is considered to be guidance, the National Minimum Wage is a legal requirement and must be implemented. The penalties imposed on employers that are in breach of the minimum wage legislation are 200% of arrears owed to workers, with the maximum penalty being £20,000 per worker. For those employers and employees paying into an Auto Enrolment pension scheme, increases in contributions come into force from the new payroll tax year on 6 April 2019. This means that the minimum total contribution to an employee pension fund for all eligible employees increases from 5% to 8%, with a condition that the employer contributes a minimum of 3%. Again, this is a legal requirement and must be implemented to avoid severe penalties. On a more positive note, the levels of income at which an individual begins to pay income tax increases from 6 April 2019 from £11,850 to £12,500. This has the knock on effect of increasing the higher rate band, at which individuals start to pay 40% income tax to £50,000. The additional rate band remains unchanged, and starts at income greater than £150,000. Please remember that at £100,000 of total income an individual begins to lose their personal allowance, increasing the amount being taxed at 40%. This means that those earning between £100,000 and £125,000 face an effective rate of tax of 60% on the element of their earnings that falls into that bracket. If you are concerned about how this might impact you, please contact the tax team who will be able to advise you. The level of income at which National Insurance Contributions are charged also increases to £166 per week. This means that if you are an owner of a limited company paying yourself by way of salary and dividend in the most tax efficient manner, you should increase the monthly salary element of your remuneration from £702 per month to £719 per month. For all other tax updates and changes, please see our 2019-20 tax card, which is available for you to download in pdf format here. Do remember that you still have a few days to maximise your savings in the 2018-19 tax year before you lose your annual allowances. The current ISA allowance is £20,000, and the standard pension contributions allowance is £40,000 per annum. Do see a financial advisor however, especially if you earn more than £110,000, to be sure that your annual allowance hasn’t been reduced, and to find out if you have any carry forward allowances left from the previous three years. If you would like an introduction to a financial advisor at our sister firm Cullen Wealth, please let us know and we will be happy to enable that. Finally (for now…) as you come to prepare for the completion of your self assessment tax return for 2018-19, you may find our You Tube video on the subject useful. Please remember not to leave it until the last minute to pull your information together, and do contact us should you have any questions. As always, any questions or comments, please ask!